Back either side with the Arsenal v Tottenham Offer to earn Free Spins on the Football Champions Cup Slot! The Emirates will host the first North London derby of the 2016/17 campaign this Sunday (November 6), and Unibet gives you a chance to capitalize on it with the Arsenal v Tottenham Offer! Make a £10 pre-match bet on the North London derby (win/draw/win) to collect 20 Free Spins on the super-popular Football Champions Cup Slot. 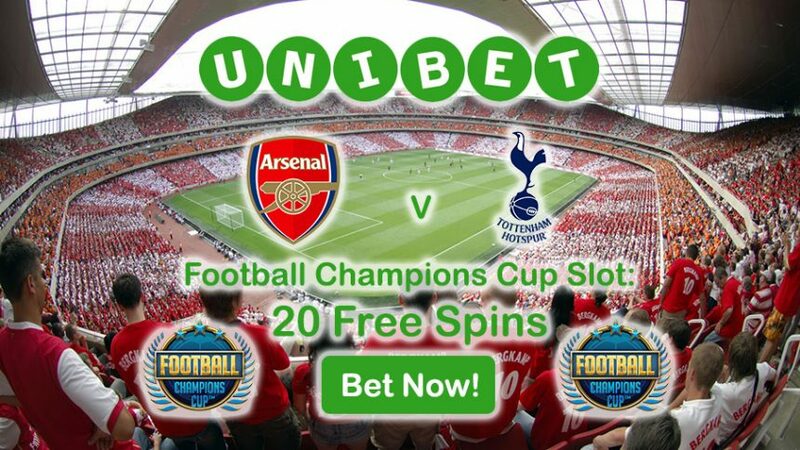 The Arsenal v Tottenham Offer is a one-of-a-kind opportunity that utilizes both Unibet Sports and Unibet Casino – bet with the online sportsbook and then use your Free Spins on the football slot at the online casino. Just make sure to place your wager before the game kicks off this weekend (12:00 GMT, November 5). Arsenal find themselves tied with Man City and Liverpool on 23 points at the top of the table, and over the last five matches they’ve enjoyed great form that has seen them clinch four wins, while suffering only one draw. Arsenal boss Arsene Wenger has even recently come out saying this could finally be the year that sees them lift the Premier League trophy for the first time since 2004. Arsenal are third favourites to be crowned champions in May 6.00 (5/1), behind the likes of Man City 2.35 (27/20) and Liverpool 4.25 (13/4), but their odds may very well improve after round 11 is over and they’ve managed to extend their sublime form. Earn 20 Free Spins on the Football Champions Cup Slot with the Arsenal v Tottenham Offer! We’d suggest placing your bets on the Gunners, considering they’ll be playing at home where they maintain a better record (W3 D1 L1) than Spurs’ away form (W2 D3 L0). Unibet favours the Gunners 1.96 (24/25) to claim the bragging rights in the North London derby, while labelling Spurs as outsiders with odds of 4.20 (16/5). A tie between the two side stands at 3.61 (13/5), but judging by Arsenal drive this season, we’re guessing they seal a victory this weekend. Use this opportunity with the Arsenal v Tottenham Offer to get the best of both world – online sportsbook and online casino – and earn yourself 20 Free Spins for the Football Champions Cup Slot! Earn 20 Free Spins with Arsenal v Tottenham Offer!